You give but to yourself. He who understands the concept of giving must laugh at the idea of sacrifice. One of the things I find most inspiring is the sound of birds in the fresh, cool air of the early morning. When a bird sings, it has no idea that its song is an inspiration to me. 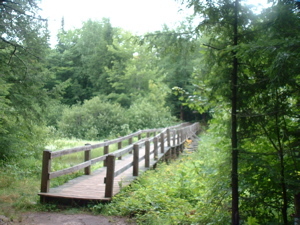 Bridge over a wilderness marsh in Porcupine Mountains State Park near Ontonogan, Michigan. You never know when your actions will be an inspiration to others. Someone may notice and remember something you did or said and you may never find out. Sometimes a simple, sincere smile from a stranger can turn an otherwise persistent sour mood around. Acting kindly to a stranger can brighten that persons day and inspire anyone who happens to notice. Smile at strangers, offer courtesy, gifts and service whenever you can. You never know when it will turn someone’s day around or even change someone’s perspective of humanity. And, there is nothing more personally rewarding, satisfying or inspiring than making someone else happy. Look actively for these opportunities. These are what an inspired life is made of. Try not to miss opportunities by allow strangers to pass unnoticed. Many successful people have built there success on relationships with people they may have otherwise ignored: people to whom they offered kindness who noticed and responded with the like. Scott Ginsburg of HELLO, my name is Scott! offers great advice in his blog on how to build relationships with people you would otherwise think of as strangers, such as in his post , Practice intentional discomfort, where he highlights several ways to meet and develop relationships with people by intentionally putting yourself in situations that might make you uncomfortable. People gravitate toward inspired people. Inspired people are good listeners. They are welcoming, patient, tolerant and easy to get along with. They recognize the good qualities and talents in others. They give of themselves with no expectations. They make us feel significant and loved. Their presence makes us feel inspired. When we are inspired, we inspire the people around us. Perhaps the most significant thing you can do to be an inspiration to others is to find inspiration yourself. You witness someone risking their own safety for the safety of someone else. Just imagining these scenarios makes me feel inspired. (And of course, having been the recent recipient of the muffins strengthens the feeling.) I suspect you will have similar feelings. Actively seek out an opportunity today to offer kindness to someone. Look for someone who could use your help. It could be by picking up a small item that was dropped or giving a gift to someone you know has wanted something. The size or material significance does not matter. What does matter is that it sends a message to another person that they are a significant part of a world which can be a kind place. Hey Danny! I’m a big believe in this philosophy. Check out Why I Talk to Everyone(part 2). It’s a story about something good that happened to me because I’ve adopted this way of dealing with people! Very awesome site you’ve created for all to enjoy! Thanks for sharing photos & ‘Be An Inspiration’! Wonderful opportunities to live by, & very fulfilling, too. Graham, thanks for pointing out your article. I have read it and it is a great story and a valuable example of what I’m talking about here. The way we treat others really does come back to us. Scott, thanks much for visiting the site and for the kind words. I’m thrilled to hear that someone I draw inspiration from appreciates my work. Linda, thanks for your kind words. I’m glad the photos and this post are meaningful to you. I hope that you continue to find value here.